The Tajnagari needs no introduction. It is home to perhaps two of the greatest symbols of love. Taj Mahal and hot street food made with love. I came here to give the latter its due attention. The city comes to life in the early hours of the day, and so did I, excited to explore this culinary haven. My ambrosial journey through the rustic lanes of the city began at Dilli Gate Chai Waala, a small, bustling shop that never closes. And it literally never closes, serving piping hot tea 24×7, this ever-welcoming shop does not even have a shutter! Here I met Tahir, who shared my passion for greasy street-food and was well versed with the nooks and corners of the city, to take me on a breakfast food trail. We started with some Chai with pleasing flavours of ginger, long pepper, and cardamom; and to go along with it some butter lathered elaichi rusk and Bun Maska. The Bun Maska, like all other breads available at this place, was toasted on coals, which is their speciality. With Chai in our systems and appetites expanded, we were ready to take on our next adventure and have, as Tahir mentioned, some Lashkari food; the food of the Mughal Army. We headed straight to the heart of the walled city, Nai Basti, but don’t let the name confuse you. Nai by name, the entire place was drenched in an old-world charm. Through the tight alleys we reached Mughal Nihari, a place known to have kept the authentic flavours and strong use of masalas intact in its Nihari recipe. The Paaye, meat, and bone marrow are all cooked overnight in the authentic masalas and served with the traditional Khamiri Roti. The fibres of the soft, well-cooked meat break down into the gravy and pleasing my palette with the strong masalas. Be sure to ask them for what among the mutton, Paaye, and bone marrow you want more and they will be more than happy to build your bowl to your preference. For Rs. 80 per plate, this place is sure to leave your pocket and your stomach happy, but make sure you reach here early in the morning as they run out of the preparation by 10 am. Next on our food trail was Haleem. 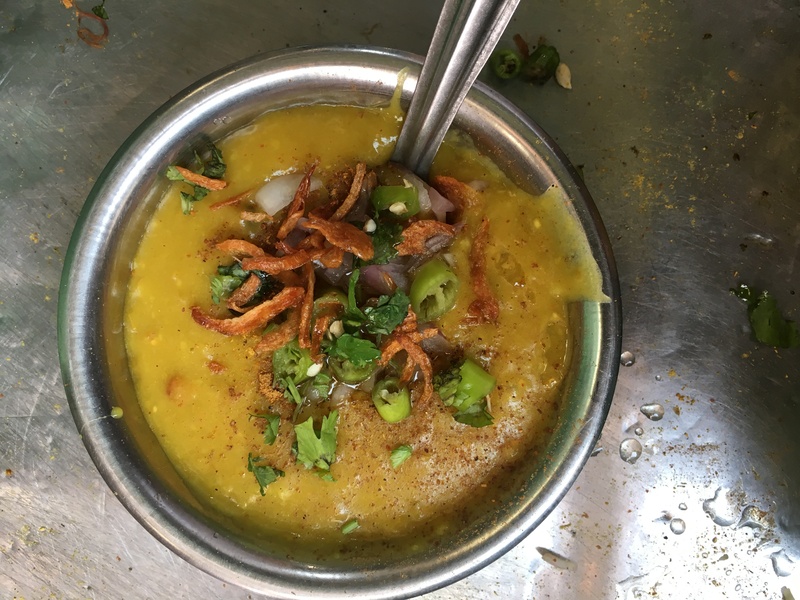 On a small, road-side stand in Kashmiri Bazaar, awaited us an early morning Haleem, a thick, protein filled gravy made of daal, meat, and an assortment of spices, that is sure to keep your hunger at bay for a few hours. This Haleem was loaded with turmeric and served, dressed with green chilli to add to the heat. The dish is cooked overnight where pressure is applied to the daal and the meat, which makes the fibres of the meat dissolve in the gravy, so you bite into a thick pool of nutrition and powerful flavours. A walk through Agra’s street food marvels would have been incomplete without some Bedai, so to get our fix, we reached Munna Lal Mithai Waala. 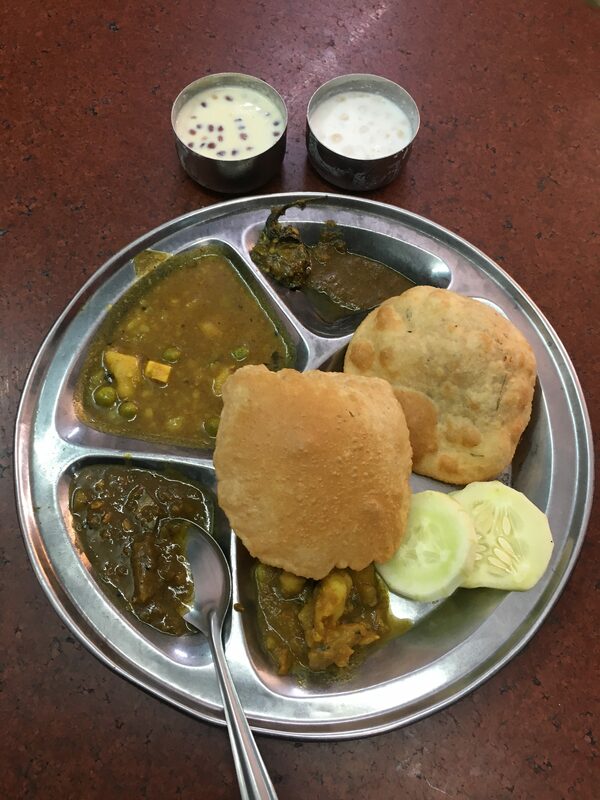 The Bedai or Bedami Puri was served with aloo ki sabzi (potato curry), pumpkin gravy, and curd. The puri, stuffed with urad daal and made in desi ghee, was satisfyingly crispy. To go with it we had Moong Daal Halwa that washed my mouth with its overwhelming amounts of ghee. Kala Mehal and its residing Sindhi community had waiting for us the Sindhi Pakwaan, which is a huge round matthi, served with chickpea gravy loaded with a strong doze of spices and masalas and topped with some fresh green chilli, red onions, and oil. After our fix of the Sindhi cuisine, we headed to an archaic looking shop that has been serving its delicacy since 1840, Chimman Lal Puri Waale. Tahir called it Agra’s “Museum of Food”, because of how well it preserved the original flavours of the Tajnagari. For a mere amount of Rs. 30, they gave us a plate loaded with two puris, one of them stuffed with a methi or fenugreek filling, and small portions of potato-chickpea sabzi, sweet-tasting white pumpkin sabzi, aloo-matar-paneer sabzi, some chutney and achaar, and to wash everything down, bowls of kheer and raita. Every preparation had a distinct taste, perhaps unique to Agra and Banaras. 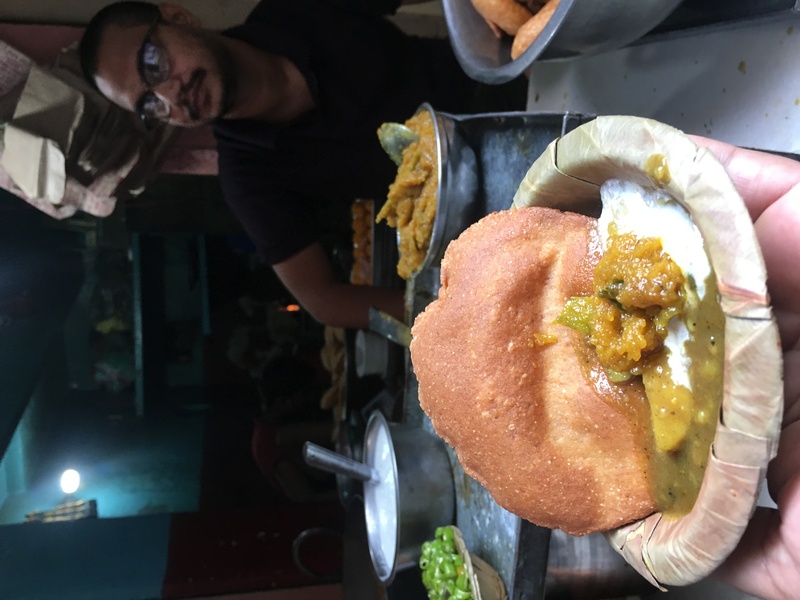 To end our breakfast tour, we arrived at Gopaldas Petha in Subhash Bazaar to try the much-coveted Agra ka Petha wrapped in the refreshing flavour of gulabjal. 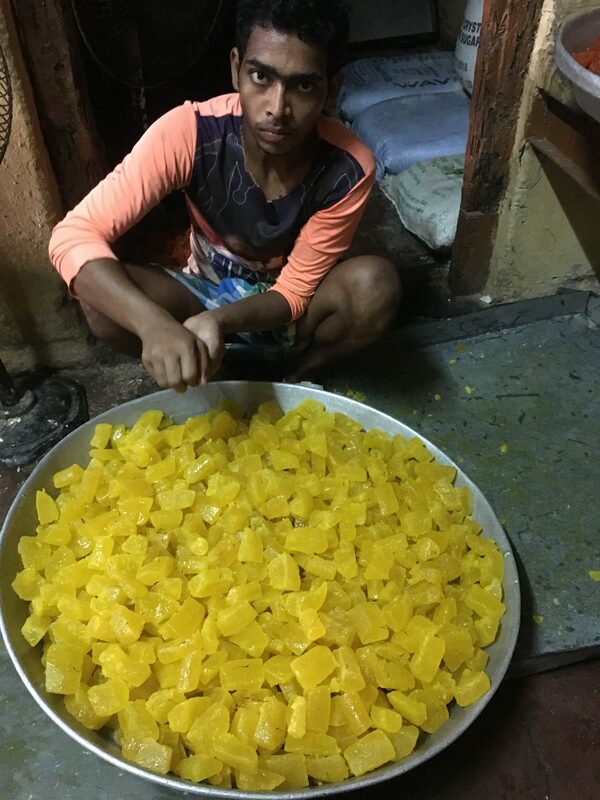 Petha was once known as the “dessert for the poor”, because of the inexpensive ingredients that go into its making, but the end result left me absolutely content. You can get this Petha for Rs. 300/kg at Gopaldas Petha. Agra truly served its culmination of communities, cultures, and history on the plate with just the right amount of sweet, spice, and warmth.